The holiday season is in full swing – that means it’s officially time to decorate! Leaving your Christmas decorations until the last minute isn’t really an option for most families. So how do you make putting up this season’s display little less painful and a little more efficient? It may seem obvious, but measure the space in which you’ll be hanging the lights. This is a great tip to remember whether you’re planning to string lights inside or outside your home, as it will help you determine how many strings of lights you will need to purchase, how many hangers will be needed, and what sort of effort will be required. What other tools should you have before you even begin? 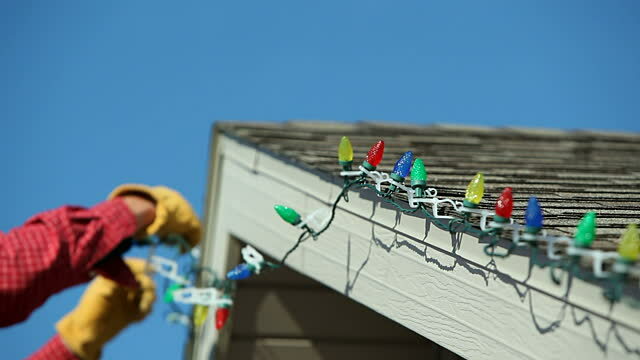 Unwrap and plug in each string of lights to test for burnt out bulbs, replacing them as needed. Then, you’ll want to check extension cords for any damages or breaks. Ensure that all materials and measurements are assembled prior to starting your project. You should have a partner helping you. It’s best to start this project early in the day, when you’ll have plenty of sunlight available. Around the front door: You’ll want to use adhesive strips for this. Another creative touch is to twine the strings of lights with garland for a classic look. Along the driveway: You can create a magical impression by running white lights along either side of your driveway. It’ll look like a landing strip for Santa! Use stakes in order to elevate the electrical cords off the ground. Over shrubbery in front of your house: Net lights are simple and create a beautiful effect. For each of these spots, adhesive strips that won’t damage walls or woodwork are available and very reliable. Some families put up the same display year after year, while others are always looking to try something different. Get to know your house, and your neighborhood, and you’re sure to find some festive inspiration. All you need is some time and a bit of planning in order to create a gorgeous display of holiday lights. Do you decorate inside, outside or both?